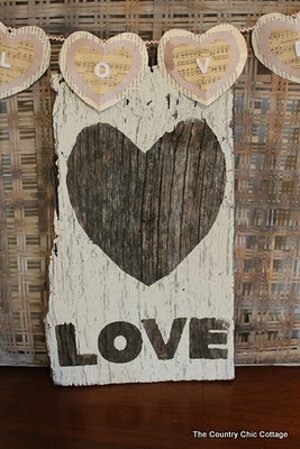 Perfect for Valentine's Day or a rustic or country-themed wedding, this Rustic LOVE Sign is easy and fun to make. In less than three steps, you can have a beautiful decoration that's simple, yet classic. You could also make your sign say whatever you'd like. If you're getting married, try writing your last name or the date of your wedding. This is also a great way to remember the birth date of your first child or grandchild. Find this pattern and many more in our new eBook, 41 Valentine's Day Crafts: Valentine's Day Cards, Gifts, and More! I cut out a heart from brown paper. The letters came from a pack of post it letters for poster board signs. For this one I tried out the crackle finish from Martha Stewart. I will warn you that the directions say to apply over a primer. I didn't. I wanted the barnwood to show through the cracks. The Martha Stewart product is THICK. It needs to be applied like spackle with a putty knife. I just used my pieces to mask the area off I did not want painted. I did not even tape them down or anything. Apply an even coat and then sit back and watch the magic. As it drys, it crackles! Lovely chippy paint in one simple step. Thank You for the info on Martha Stewart crackle finish, we were looking for a crackle for a specific project and from your description, that sounds like what we need! This project is darling and will be perfect for the school's fundraiser, every body needs some LOVE! !